Like a lot of people, one of my goals for 2015 is to up my fitness and adopt a more healthy diet. Too many cakes and a desk job have left me feeling a bit squishy, lethargic and generally unmotivated, so I’ve been on the hunt for solutions to help give me a kick-start. I was recently offered the chance to try out a Fitbug Air* from the lovely people at GiffGaff, so took this as a sign from the exercise gods and excitedly awaited its arrival. Fitbugs are a small piece of kit (about the length of a lipstick) that can track your daily step count, time spent exercising in your ‘cardio zone’ and sleep quality. It can be synched up to an app on your phone that tracks your progress, plus an online account which allows you to input your daily food intake and overall goals. I’m naturally quite competitive (don’t ever play me at Monopoly. Seriously.) so I loved the idea of being able to compete with myself, trying to beat my step count each day. The Fitbug Air comes with a handy little clip, so you can secure it to your waistband discretely and the slim size means that it’s not very obvious that you’re wearing it, unless you’ve got something really fitted on. Setting it up was pretty simple, although I was a little annoyed I had to go online for instructions on how to do this – I’d much prefer a guide in the box. I also downloaded the Fitbug app to my phone at the same time and ‘paired’ it to my Fitbug device. This meant that the Fitbug would transfer data over to my app via Bluetooth at specific intervals, allowing me to track my progress with ease. The Fitbug itself was really easy to use, and it seemed to be pretty accurate at tracking my step count. I’ve had pedometers in the past that promised to do that, but seemed to count the tiniest of movements, so made you think you’d done a lot more than you had. Not the Fitbug – somehow they’ve got it to measure accurately. Even after a 90 minute power walk, I was rather disheartened to see I’d only done 8,000 steps – 2,000 shy of the 10,000 you’re meant to achieve each day! I had a few problems getting the Fitbug to synch up with my app, which meant that not all of my progress got recorded, but once I finally got this sorted out, it was really good to see how I was doing each day. I found it a bit of a faff having to go onto the website to enter my food intake to log what I was eating – I’d have much preferred to do this via the app and I’m not sure why they haven’t set it up to do this. 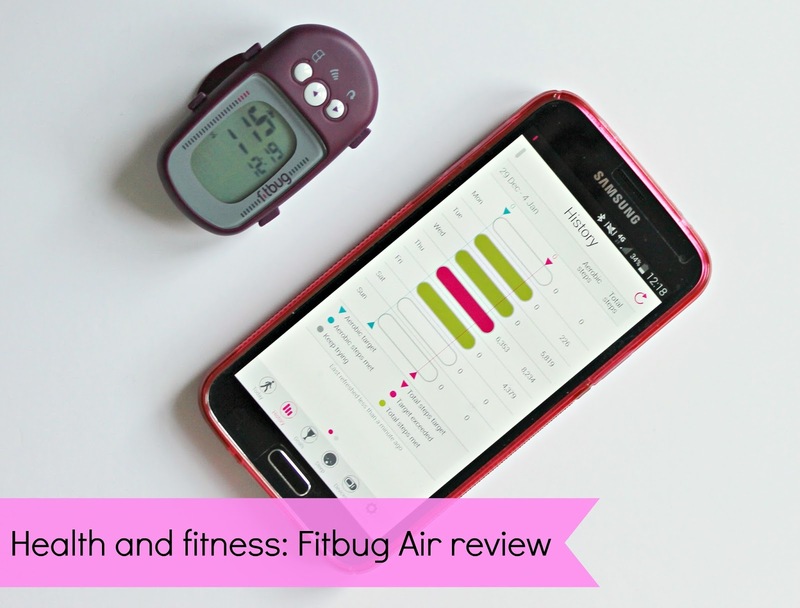 The Fitbug Air isn’t cheap at £49.99, but I think it’s a great gadget if you’re on a bit of a health kick and are keen to track your step count, and be able to monitor your progress quickly and easily. It is battery-powered, so you’ll need to replace these after about 4-6 months, but other than that, there’s no extra costs on top of the device itself. I’m looking forward to continuing with mine over the next few months and seeing how I get on. It’s definitely motivating me to be more active – that competitive streak is coming out! Have you used a Fitbug or other fitness device before? Is this something you’d like to try? Oh I'm actually quite tempted by this! I think if I'm still really trying by the end of Jan I will treat myself to it. Like you I know I will be competitive with myself and try and break my step count each day, even if it's just by a little bit or to get a rounded off figure! I've been wanting one of these devices, I just haven't been able to decide which one, this is very reasonably priced though. I'd like to hear more about the sleep tracking, how do you wear it for that to work? I love wearable tech, I literally want them all! I use a Polar FT4 to track my calories during exercise, but I've not set up the app so I don't know how good it is haha! It's annoying that this one doesn't let you do your calories by the app, you could always use My Fitness Pal just for food?